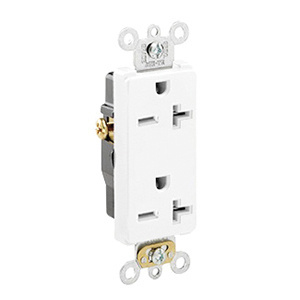 Leviton Decora Plus™ Heavy duty straight blade duplex receptacle in white color, has a unique design with high impact and chemical-resistant, thermoplastic nylon face and body construction for long-life durability. This 2-Pole, 3-Wire receptacle features heavy gauge zinc plated steel locked-in wraparound strap and triple-wipe brass contacts. It operates at a voltage rating of 250-Volts, current rating of 20-Amps, temperature rating of -40 to 60 deg C and dielectric strength of 2000-Volts. This receptacle supports maximum load capacity of 1-1/2 HP. It includes brass staked on self-grounding clip, zinc plated steel clamp nuts and brass plated ground clips. It is suitable for commercial applications. The straight blade duplex receptacle meets NEMA WD-6, ANSI C-73, UL498 File E13399, CSA C22.2 No. 42 File LR-406 and NOM 057 standards. * Inventory displayed is accurate as of 04/21/2019 04:40 EDT.